This week was to be the first week of my re-entry into serious training. I had goals: ride tempo pace, put in longer mileage, sprint for real this time, attack the hills, go to the 24 Hours of Light and race the boys. On Monday, I planned to inaugurate my summer schedule with a tempo hill climb on the Eaglecrest road. But seven miles into the ride, my rear shifter cable snapped. I pulled over the side of the road to remove the dragging cable and assess how much I still wanted to climb a five-mile-long hill in my highest gear on back. As I threaded the broken cable through its housing, I saw it was frayed nearly throughout. I started to wonder if my cables had ever been switched out ... on a bike with somewhere between 10,000 and 12,000 miles on it. I examined the brake cables and front shifter cable, also frayed in spots and nearly separated at the ends, held together in threads by the end cap. As I loosed the cable bolt on the derailleur, I noticed its cogs had been worn nearly smooth. No spikes were left to hold the chain. There are always little problems with my bike that I ignore and ignore. But when I add them all up, Roadie is one sick puppy. Either way, Monday as a training day was shot. Today I had planned to go to the gym to restart my weight lifting routine, but when I woke up, the sun was beginning to burn through a bank of fog, and the outside thermometer read 33 degrees. That must mean there was a freeze last night, I thought, and the day looked to be clearing but still cool. 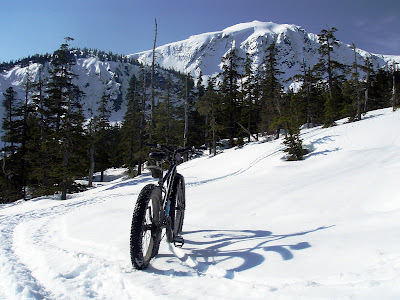 You can't buy better spring snowbiking weather than that, and it seemed a shame to waste it. So I dragged Pugsley up the Dan Moller Trail. The sun was already burning hot by the time I reached the trailhead, and the snow was starting to mush up in spots. 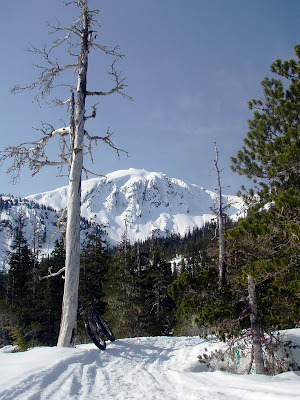 But in the shade it was hard and fast, and so crinkled with the deep waves of snowmobile moguls that I felt like I was on a mash-potato-smeared roller coaster. The sun spots were greasy enough that I had to stand and drag my right foot on the ground like a ski/brake just to keep the front wheel from swerving all over the place. The muscle burn was real, and I remember thinking I didn't have to go to the gym to get a focused workout for my quads. I was bucked off the bike a couple of times but always giggling about it. The snow becomes less ideal every day, and still I have a hard time giving it up. It's my comfort zone, my release. It's hard to worry about repairs and tools and goals when you are just trying to hold a straight line down a slippery trail. But, Wednesday, Wednesday I'll get on track with my training. What did I have on the schedule? More Pugsley? The rain was coming in sideways when I felt my rear rim dragging on pavement. I pulled over to the side of the road to assess where I was; I had been squinting into the dim yellow circle cast by my headlight for so long that I wasn’t even sure. I shifted my trunk bag to reach my repair gear when it dawned on me that the headlight was in fact my only source of light. There was no way to illuminate the wheel so I could change the flat. I clip clopped in my cleats down the road, grumbling about how I really should have switched out my pedals when I had the chance. I walked nearly a half mile before I reached the nearest street light. Slimy brake dust goo and grit dripped down my fingers as I removed the rim. The rest of the flat change went quickly, but as I stood up to leave, I realized that the jeans I was wearing, covered by my very best pair of rain pants, had already soaked through. The denim chafed and scraped my thighs as I started pedaling. Stupidly, I had left them on because I thought they would keep me warmer than my wet tights. I stopped to adjust my pants. It was 11:15 p.m. My socks were soaked. My gloves were soaked. The headwind was so strong I had barely cracked 10 mph since I left work. "Could this commute be going much worse?" I thought. That's when I noticed my red blinkie was missing from my trunk bag. Today was day five of my summer as an everyday bicycle commuter. Today was also day five of my summer as a single person. I can’t say either is going very well, but at least I can still attribute the glitches to growing pains. Packing for the commute has been an experiment in disarray. I've been using a rear pannier, a trunk bag and a Camelbak just to carry all the crap I have with me, and still every day I forget something crucial ... my bike lock, a salad I had planned to eat for dinner, dry socks, the key card I need to get into the building. When the weather is similar to what it has been these past two days - steady rain with sustained 20-25 mph winds - I've learned I need two pairs of gloves, two pairs of underwear, two pairs of socks, rain coat and pants, my regular bike clothes, and my work clothes. If I don't carry two pairs of regular bike clothes, I either have to put wet clothes on when I leave, or wear my work clothes home, as I did yesterday. My office is set up "newsroom" style (i.e. a cubicle without the cubicle) Company decorum dictates that I can't hang up wet clothes everywhere, so everything but my coat and pants gets stuffed in a drawer, where it stays wet. As I suspected, the wetness has been tough. I still get out in the morning for workouts. Today I did a quick-but-strenuous block of intervals over 19 miles, came home soaked, took a shower, and then had to head back out in the weather to go to work. And I have to admit that I leave work thinking, "Hmm. I could be in a warm car right now. I could be home in 10 minutes." I leave work at 11 and all I'm interested in is being at home. I do not want to be riding my bike in the rain. I also miss my dinner breaks. I used to take an hour every day to go home and eat dinner with Geoff. Now that he's gone, there's no reason for me to go home for dinner. So instead I take about 20 minutes and eat a salad in the company break room. Spending my entire shift at the office sure makes the workday seem longer. But I'm not about to go back out in the weather. That said, I'm going to stick with the bike commuting. I'm hoping routine kicks in to make it less stressful, and experience kicks in to make it more enjoyable. I figure bike commuting is like endurance racing ... suffering is what makes the experience worthwhile. Yes, I know these videos are pretty silly. But I have fun with them. Isn't that what matters? Today's song is "My Rights Versus Yours," by the New Pornographers. My housemate and I have agreed to shut off the heat as a way to conserve energy in this time of electricity famine. Although it's spring now and the weather has been really nice this week, the temperatures still drop into the low 30s at night and our northeast-facing apartment doesn't see much direct sunlight. The whole house has this icebox feel to it. The last time I walked by the thermostat, it read 57 degrees. I was really, really tempted to turn it up. But instead, I headed back out on my Pugsley for a little trail time after riding nearly 50 miles earlier today. Having no heat is actually a great motivator to get out. Cycling is still the best way to stay warm. 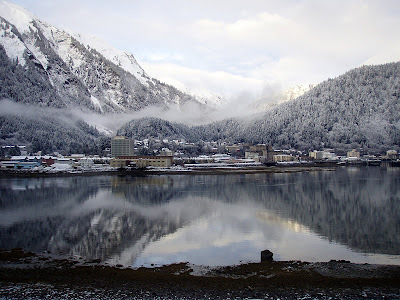 Right now in Juneau, saving energy is on everyone's mind. The prospect of having your electric bill increase fivefold will do that. The electric company recently reported that in a week's time, Juneau's energy use dropped 20 percent. It continues to drop more every day. People are making a conscious effort to turn off lights and appliances. They're hanging clotheslines in their living rooms (Drying clothes outside is rarely feasible in Juneau, although it has been possible this week.) My housemate and I went through and unplugged most of the cords in our house. Since I dislike cooking anyway, I happily stick to my salads and sandwiches and leave the stove turned off. We keep the refrigerator on - it seems like a luxury now. As does the computer, although it's off a lot longer these days. It actually feels good to make these little sacrifices. Not because we're saving a ton of money (although, with the heat turned off, we are.) And not because we're staving off the burning of emissions-spewing fuel (although I do feel strongly about doing my part, I have my fair share of pessimism in this regard.) No, giving up a few electric luxuries feels good because it makes me feel more self-sufficient. I don't need electric heat to survive. I wouldn't even need it if it were winter - I'd pull out my -40 degree sleeping bag, my down jacket, my boots, my coats. There must be a reason I own all of that stuff beyond the agony of winter camping. It's survival gear, and I cherish it, because it means I'm free. That's also the same reason I've resolved to become a more dedicated bike commuter. I was much too dependent on my car, even though I mainly used it as a way to travel to work in dignity (i.e. not showing up at the office wind-blasted, grit-coated and dripping rainwater.) But the truth is, I can duck into the bathroom, change my clothes, blow-dry my hair, and still walk up the stairs in dignity. It really was just an excuse to justify my car dependency. But eventually (and probably soon) that car is going to break down for good, and I'd like to believe I don't need to replace it. Because if I'm free to not own a car, I'm free to divert more of my time and income into the things I truly enjoy. So, yes, I'm aiming to go car-free for completely selfish reasons. I really believe that the less dependent I am on things, the happier I can be. Of course I still have things I can't live without - my bicycles, my cats, my -40 degree sleeping bag, the poisonous cans of Diet Pepsi that I suckle with reckless abandon. I'm not aiming for extremes. I'm just trying to strike a balance between owning nothing and being owned by things ... a happy place, more freedom to move, more space to live. Today was errand day. I had time to squeeze in a decent ride while my car was at the shop, but for the most part I spent a beautiful warm day knocking mundane things off a list that I had let build for a little too long. It made me miss Geoff that much more. I really took for granted all the little things he was always the one to do ... grocery shopping, recycling, repairs, cleaning. Now that I need to do all of this stuff for myself, I won't be able to just let my life revolve around working, eating, and biking anymore. I actually have to be self-sufficient again. Much of my day revolved around my car. I had the summer tires put back on (only nine days past the legal deadline. Better than last year.) I had the oil changed. I vacuumed up a winter's worth of dirt from the upholstery, scrubbed all the panels, cleaned out the trunk and sprayed down the exterior. I took it on all the errands I need a car to do ... haul multiple boxes of trash to the recycle center, and buy calories in bulk at Costco. Then I put some gas in it ($3.75 a gallon), drove it home and parked it in my designated parking spot, where I plan to let it sit for quite a while. My summer of bike commuting has officially begun. I nearly have my road bike ready for on-demand transportation (lights, trunk bag, bike lock mount, rack with optional waterproof panniers and new tires.) It still has clipless pedals, which I think are bad for commuting because they require use of cleat-bottomed shoes that are unpleasant to walk in. I can't mount my platforms yet because Geoff took the pedal wrench, so I need to buy a new tool first. I plan to use my bike to commute to work every day, as well as evening outings, the library, and other miscellaneous errands. I will probably still use my car to go grocery shopping, since I dislike grocery shopping so much I usually only go once every two weeks and pile up $126 worth of food at Costco. (It is possible for a single person to shop at Costco, as long as you don't mind eating a big spinach salad and a chicken breast for dinner every day for a week.) And I have never been good at quitting anything cold turkey, so the car will probably still come out on rainy days when I am really grumpy. But for the most part, I want it to sit. It struck me today as funny that I was doing all this work on my car only to not use it for most of a season. Some of the work was necessary (getting my illegal studded tires removed.) But the rest struck me as a form of winterizing - similar to the way people clean and tune up their bikes before stowing them in a basement for the winter. It just seems that if you are going to neglect something, you might as well do it with dignity. And so my car sits. Let the commute begin. I traced the emerging trail beneath a canopy of spruce trees, dripping snowmelt and strings of moss onto still-frozen mud. I reconnected with the paved bike path and rolled back to Geoff, who was parked on a bench and inhaling a sandwich. "Still a lot of snow back there?" he asked. "It won't be too long now before this town has real mountain biking," I said. "Not soon enough," he said. He held out the remaining piece of sandwich. Tuna and mayo on pumpernickel bread. I wrinkled my nose. "How bout a Tootsie Roll then?" I took the chilled piece of candy and popped it in my mouth. It was meaty and a little bit stale from possibly a few too many rides in Geoff's coat pocket. I kicked a piece of ice onto the grass, short and dead in April. I wasn't even thinking about the promise of May. I was wondering why there weren't corpses of August flowers everywhere. "I can't believe you're willing to leave this all behind," I said. Geoff smirked. "It's not too late to come with me." I shrugged. "I'm pretty sure I'm going to quit biking. I think I'll get some Direct TV or whatever the cable companies are pushing these days, and put in some good time on the couch with Bon-Bons." "Ok, Cheetos. And Coco Puffs straight from the box. The works. I'm really going to put in the hours this summer. Next time you see me, you're not even going to recognize me." "You'll have to get a working TV first." "I hear they sell those at stores these days." Geoff laughed and looked away. "Whatever. You're probably exicted not to have me around bothering you and trying to feed you real food anymore. I know you're just going to end up riding 100 miles every day." "I wish it was as easy as that," I said. Geoff reached into his coat pocket. "You want another Tootsie Roll?" "No," I said. I squinted at his watch. "Is it really noon?" He nodded. "I really have to go," I said. "I'm going to be late for work. How much further are you going?" "I'm going to try to get 100 today," Geoff said. He stuck the Tootise Roll in his mouth and we rode together to the end of the bike path. I turned back and he kept going, toward summer. The rash of nice weather continues, and I feel like I should have endless, boundless energy - the self-perpetuating kind that feeds off warmth and light and gives me the boost I need to launch into summer. But instead I just feel a little sluggish, a little weighted, a little too tempted to crawl back into bed for early morning naps. The stamina's not there. I lack motivation. And focus. Focus is something I need right now. In two days, Geoff leaves to head south for the summer and I need some projects to ward off the loneliness. Now would be a great time to prepare for a big event, if only I had one to work toward. I have some ideas, but nothing that really warrant the necessary vacation time or expense. I was thinking of embarking on a fast tour somewhere, but do I really want to burn a week of vacation to spend more time by myself? Lower 48 races are out of my league. 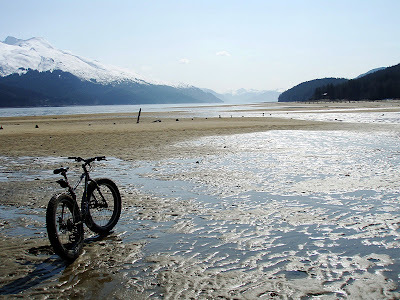 Southeast Alaska has almost nothing to offer. I browsed the local bike club site today and found a bunch of 12-mile time trials and short mountain bike races on Saturday afternoons, when I'm at work. I already have plans to head up to Whitehorse for the 24 Hours of Light, on June 28. But I'm torn about how to train for this race. For starters, I'm tempted to join a noncompetitve team of four or eight because I know I'll have so much more fun that way. But I'm also interested in riding a hard 24 Solo and really trying to push myself. It's a little silly, however, to attempt a 24 Solo in event like the 24 Hours of Light. If I'm riding laps the whole time, I'll completely miss out on the mountain bike festival atmosphere, which is the best part of that event. I'm also likely to have little to no competition. I "won" last year's solo race by beating out the only other solo woman 13 laps to 4 laps - and I stopped and partied for the whole second half of the race. It's probably going to be kind of hard to motivate for those 4 a.m. laps when I'm 10 laps ahead of the second-place competitor and there's no Geoff there to cheer me on, because he's out in Colorado somewhere doing something much more difficult. I'm just drifting a little right now, and I don't have any great ideas. When I woke up this morning, a swirling blizzard was raging outside. Of course I was thrilled about this development on a Thursday morning. "What should I do today?" I asked myself as I hurried to gulp down my Special K so I could get outside before it melted. "Should I go for a bike ride? A hike? Maybe try to do a snowboard run?" Then it hit me. Why not do all three? I don't really have the gear to just ride my bike with a snowboard on my back. I tried to stuff the board in one of my larger daypacks, but its angle and height made my shoulders ache something fierce - not to mention the way it caught the 15 mph headwind like a giant sail. My original destination was Eaglecrest. I made it about eight miles past my house, just shy of the cutoff, before I decided that there was no way my screaming shoulders could survive the climb. I turned around with a new destination - the Douglas Ski Bowl. 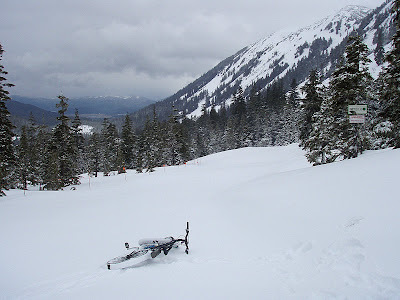 I parked my bike on the snowmobile trail just as the powder started to become soft and deep, and strapped on my snowshoes. The storm had moved on and the clouds were starting the clear out. I could see strips of blue sky above my head, and something strange, something bright ... could it be the sun? I could hardly believe it. In the walk up, the presence of that alien orb made everything feel superheated. Sweat poured from my scalp. I only had about 30 oz. of water with me, no sunscreen, no sunglasses ... but I was all but bounding up that trail, just happy to be awake and alive and bathed in sunshine. I reached the ridge and looked out over Admiralty Island for the first time since January. I miss that view. I live my life in the shadow of the Douglas Island ridge, when all that time this horizon stretches just beyond my grasp. I dropped into the canyon, paralleling someone's high-line snowmobile trail in a soft cloud of powder. The whole world disappeared behind silence and weightlessness, falling and flying at the same time. When you spend all of your time on a bicycle, you forget what that feels like. I was completely in awe. I stopped in the bowl and climbed up for more. I couldn't figure out why I hadn't just spent my whole winter powder boarding. It took me a couple more runs to remember ... I'm really much better at cycling than I am at snowboarding. Everything's beautiful until you take a nosedive, then it's just bounce, bounce, followed by a lot of exhausting swimming. On the way down, I swerved to miss a big knoll only to realize I had nearly run over the Dan Moller Cabin ... normally a two-story structure that sits at about 2,000 feet elevation, still completely buried in snow. It was a somewhat painful reminder that hiking season is still a long, long time away. But that's OK. Winter can stay. My co-worker Brian shot this photo just as we were returning from our respective dinner breaks, about 7 p.m. We had about three inches by the time the sun set, and more slated for tonight. It was a little surreal to watch fluffy piles of new snow shimmer in the 9 p.m. twilight. A collision of seasons. I love it. Anything to lift the landscape out of the monotony of rain, which will surely return tomorrow. The snow has everyone freaked out right now, and not because there's a few soon-to-melt inches accumulated on the ground. A massive avalanche cut down a series of transmitter towers to Juneau's hydro-power station, and the local utility announced they will be switching to diesel power until they can enter the unstable area and fix the transmitters, likely months. In the meantime, our power rates will be jumping 500 percent. 500 percent! When you look at your monthly power bill for $46.48 and do some simple math, the prospect is downright horrifying. Meanwhile, I think about those generators pumping out hundreds of thousands of gallons of diesel fuel to feed Juneau's electricity appetite. That forms its own surreal image. The idea of water flowing from the mountains and giving us power is vague enough to be beautiful. But to think about Juneau being hooked to a massive, fuel-sucking generator is disheartening enough to make the smallest power uses seem so wasteful ... the things I like and depend on ... my reading lamps, my refrigerator, my computer. I walk around turning off lights and appliances but I feel like I'm throwing water balloons at a forest fire. A raging forest fire. The kind that sets ablaze everything in its path. In its path like my housemate (and landlord), who is already on the ledge about selling his condo and will probably take the leap. In its path like my employer, who is already on the ledge about expenses, the largest and most easily expendable of which is its workforce. In its path like the local housing market, which will likely go even further to raise already astronomical rents and tighten already insurmountable no-pet policies to coax any of us who might lose the meager roof over our heads back into living at the Mendenhall Lake Campground. These things have a way of changing lives. But what can I do besides cut tiny threads of my connections to the grid, maybe go to bed early tonight, maybe turn off my computer? Even so, I can usually achieve at least three hours of quality cycling before the deep chill slices through my meager barrier (at which point it just keeps cutting.) But that hasn ’t been the case lately. I don’t know if it’s a breakdown in every piece of clothing I own, or if my body is tired, simply tired, of being put through this crap. But I feel like every ride I embark on these days leaves me stiff and shivering, trying to remove soaked clothing with numb fingers as my rewarming skin flares with pain. I’ve had more brushes with uncomfortable cold in April than I ever did in December, January ... even February, when I did my fair share of riding in near-0-degree conditions and saw temperatures of 20 and 30 below. I hate 38 and raining. There, I’ve said it. Hate it. It’s tough because not only has this recent weather derailed my resolve to amp up my training and keep a strong base through summer, but it’s also causing me to waver on one of my main summer goals - giving up use of my car. I was planning to wean myself slowly. By July I hope to commute every day to work, to the grocery store, to visit my friends, to see movies and plays ... everywhere (with the exception of twice-monthly trips to Costco for much-needed cases of Diet Pepsi and orange juice). I don't really expect to save much money (my car is worth too little to bother selling and I already spend more on bike food than gas). No, I just want to try cycling as a lifestyle - like touring, but with income. It’s a beautiful dream, but right now I’m having a hard time even getting my summer-of-commuting off the ground. I think about being wet and cold not only once per day, but three times (maybe more). I’ll have to return from my training rides to take a shower, then commute to work, then completely change my clothes, then work for four hours, then eat dinner out of a microwave in the company break room, then work four more hours, then put all my wet and muddy bike clothes back on, then commute home. It’s a hugely daunting prospect to think about doing this every day. It may very well be my greatest challenge yet. Anyone have a rubber suit they could sell to me? Here in Juneau, we have to set the "awful" bar on our weather gauge a bit higher than most places. Raining? Windy? Snowing? Cold? Some combination thereof? That's just weather. Torrential downpours? Hurricane-force blasts? Blizzards? That's just interesting weather. The top level on the terrible weather scale is reserved for deep-set grayness that smothers multiple days and even weeks, grayness so thick it seeps down the mountains and into the moods of everyone you meet, and rain that falls continuously for 48, 72, 96 hours. I am not talking about wimpy storms that drizzle for a bit and then retreat behind overcast skies. No, I am talking about water and slush and snain pounding the ground without pause for three days straight. You know the scale has tipped when people start talking about the weather. People in Juneau don't talk about wet weather for the same reason people in Fairbanks don't say "sure is cold out" and people in Las Vegas don't say "how 'bout that sun today." You don't bother to mention the things that happen most of the time. But when a week goes by without even a break in the clouds, wet weather begins to nervously trickle into conversation. You also know awful has come when you start to see umbrellas around town and it isn't even tourist season. Locals in Juneau don't use umbrellas. It's a symbol of Southeast Alaskan pride, a mark of non-sissiness and grizzled acclimation. Umbrellas are a sure sign of distress, our last act of desperation before we fall to our knees and pray for forgiveness before the apocalypse annihilates us. Today I went snowshoeing up the Mount Jumbo trail. I wasn't even all the excited about getting out of bed. But even though I am dialing back my bike time, I still recognize the importance of going outside on a regular basis - lest I start to grow mold. 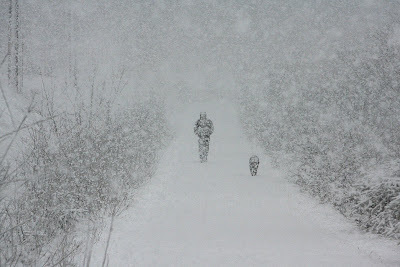 At about 1,000 feet the sleet turned to snow, and by 1,800 feet I had entered a canyon in the crush of a full-on, white-out, 50-mph-wind-gusting blizzard. 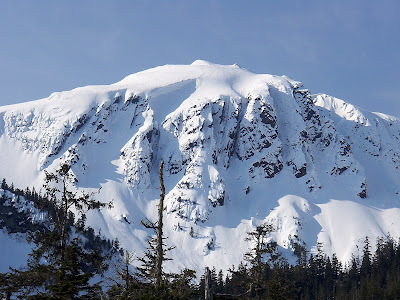 I glanced nervously in the direction of the steep surrounding slopes I couldn't even see and reminded myself that blizzards weren't so bad, but avalanches were really scary. I turned around. As I stumbled away from the storm, I began to rethink my resolve to take it easy this month. "I probably don't even need a break from the bike," I thought. "I probably just need a break from Juneau." Unfortunately, the former is much easier to implement. Tomorrow's (and Tuesday's, and Wednesday's) forecast calls for a high of 40 and rain. I don't care. I'm going to buy an umbrella. I just returned from checking out my friend Kim's set at Folk Fest. Kim is a Type-A lawyer who lives in Anchorage. She's carved out this idyllic Alaska lifestyle for herself, though, residing on the outskirts of the city in a sod-roof cabin that has two big spruce trees growing out of the roof. Her nearest neighbors are sled dogs. She ice climbs. And she's an avid old-time fiddler. As I watched her saw frantically at her violin tonight, I was flooded with the memories of the last time I saw her, on Feb. 23, the night before the Iditarod Invitational. The top picture is from that night. I realized that I never told my story of the night before the race. It was a bewildering tornado of a Saturday that couldn't have been a more perfect setup for the sensory overload of the next six days. The night of the 1,000 dumplings. We stayed in Kim's cabin, all 500 square feet of it, during the nights leading up to the race. On Saturday night, she had planned a huge Vietnamese New Year party, and had coaxed (conned?) three of her friends into making 1,000 pork dumplings for the celebration. "It has to be 1,000!" she barked. "Bad luck for a whole year otherwise!" They crammed into her tiny kitchen and set to work first thing in the morning. Geoff packed his sled. I wrenched my bike. Kim pounded cocktails before 10 a.m. One friend drove to every grocery store in a 10-mile radius and cleaned all of south Anchorage out of leeks. Geoff and I went to our pre-race meeting. When we returned around 5 p.m., starchy steam clung to the windows. Dirty bowls and plastic grocery bags were strewn everywhere. Delirious laughter peeled out from the slave-driven team. They were up to about 500 dumplings. "Don't you dare try to tell me why I'm driven to plan these huge parties," Kim told her psychologist friend. I looked up from my bike packing. "It's probably the same reason why Geoff and I doing this race tomorrow," I said. The psychologist friend nodded without a hint of irony. I think there were about 700 or 800 dumplings by the time people started showing up. I was already eating them right off the platters, forcing the only available means of precious calories down my throat as the stink of leeks and sesame oil gurgled in my gut. By the time I remembered I needed to change my bike tubes, the tiny cabin was shoulder-to-shoulder with people: 60, 70, 80 people devouring dumplings, guzzling flower-garnished cocktails, playing fiddles, asking me why I was in Anchorage (and peppering me with the ensuing thousand questions.) My pre-race anxiety coursed through my blood like magma. The chaos rattled me to the core. I slipped outside to a dark corner near the sled dog cages. The temperature was about 10 degrees. The rims burned my skin and my headlamp flickered. As I ran my stiff fingers through the motions, I tried to tell myself this was good practice for the trail. But all I really wanted to do was scream, and smash my bike, and sprint all the way home to Utah. The worst part was I couldn't leave. We had made plans to spend the night at the house of another friend in Palmer, but first we had to pick him up at the airport at 10:30 p.m. So I had to burn away the evening as the crowd became louder, and drunker, and larger, pumping old-time music into the cold air through a haze of dumpling steam and cigarette smoke. I wedged back into the crush of people to warm my frozen hands. Kim's psychologist friend was still steaming dumplings in the kitchen, 12 full hours after she started chopping cabbage. I asked her if she had reached 1,000. She shook her head and laughed faintly. Her eyes were hollow, with flecks of tears on the outer edges. Her cheeks were sunken and she pressed her lips as she smiled. I recognized that look, those eyes - the face of a broken-down endurance racer. "It's OK to cry," I said, sincerely. I could feel my own eyes misting up. "It's OK to cry." Kim was deeply immersed in her music when we whisked away to Palmer and the cold dawn of the first day of the Iditarod Invitational. I never had a chance then to thank her for letting us stay at her house, or for unintentionally helping me put my own life in perspective when I needed it most. It's a bit late to be blogging, but I feel like I need to unwind a little after a crazy "weekend" of Folk Fest. The Alaska Folk Festival happens once a year and the whole town shows up. Even a lot of people who don't live in this town show up. It's pretty much the only time of year that Juneau is visited by other Alaskans who have nothing to do with the Legislature or cruise ships. It's also the only time of year I "go out" every night for several nights in a row. Tonight was old-time Creole followed by Salsa and Fusion Celtic. I don't think I've danced like that since I was 17. Seriously. I was about to pass out and my friends still wanted to hit up the Rendezvous and The Alaskan afterward. Sometimes the endurance of people amazes me. It's been a bad weekend for bike riding. The Folk Festing for all hours of the night doesn't help, but it goes beyond that. Geoff and I huddled beneath of canopy of rain-drenched trees this afternoon as I tried to talk him out of completing a planned 80-mile ride. Finally, I just announced, "Either way, I'm turning around. I feel like I'm on the burn-out track and I don't want to push it too far." That's the first time it hit me. I haven't given my off-season much time to actually be that. If anything, I was pushing even harder before the weather took a seasonal turn for the worse. I think I need to dial it back a bit. It will be hard, because there's not much else to do right now besides road cycling. But I think if I take the rest of April and spend more time hiking (i.e. snow/mud slogging), going to the gym (i.e. 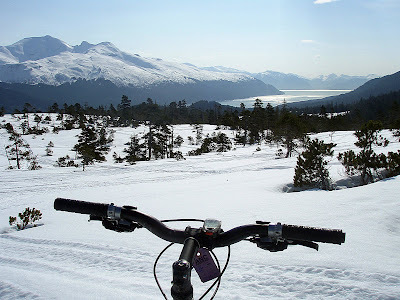 reading adventure nonfiction on an elliptical machine), and "fun" biking (i.e., beach and snow biking where and when the opportunities arise), then I'll be a happier person come summer. Once May begins, I hope to restart a fast-track endurance training program ahead of the 24 Hours of Light. I rode this race last year on a barely-healed knee injury and almost no training, and had a lot of fun. This year, I look forward to going hard. That is, if I don't burn out first. Since I discovered the motion picture button on my camera, I have become more interested in doing a little video blogging. Not a whole lot - because most home movie clips usually weave between grating and boring and mine are no different. I shot some footage up at Eaglecrest yesterday. I wasn't going to post it. Mostly because video always seems to take something I find scary and exhilarating - such as shimmying through fresh, heavy powder at a barely controlled 10 mph - and makes it look like a flatly lit slog down a ski slope. Plus, I shot an introduction, forgetting that my face was covered in mud from the sloppy climb and my bike helmet was pushed way back because that's what it takes to strap a camera to my forehead. I realized that I've never appeared "live" on my own blog before. This first shot doesn't make for a very flattering portrait. But then I remembered ... I've been doing this blog exhibitionist thing for more than two years. Since when have I worried about flattering or boring? So I'm posting my video blog No. 3. I attached a good song to it to make it more entertaining: "On the Radio" by Regina Spektor. I love spring snow. I've always loved spring snow. But I even love it here in Alaska, where spring snow is not so out of the ordinary. 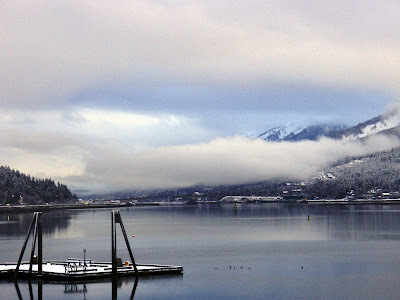 A thin white blanket settled on Juneau overnight, a temporary shield from the dull browns and wet yellows that dominate the landscape in April. So even though I had scrubbed Pugsley shiny on Sunday, thinking we would not be going out again for quite a while, I couldn't help but drag him up to Eaglecrest today. Streaks of sunlight danced across the unplowed road, until the drifting clouds finally closed together. In a swirl of flurries I pushed up the slope, right on the trail of a pair of tele-skiers. When I caught up to them, they got a few good laughs. (I didn't point out that I, a post-holing hiker pushing a 35-pound bicycle, had caught up to them.) I did concede that I looked ridiculous, coated head-to-toe in slush and grit as I was, walking a bicycle up a ski slope in April. "Can you control that thing downhill?" one skier asked me. "When there's six inches of new snow, not so much," I said. "But the base seems good so it's worth a try." I turned off at a green run called "Trickster" and kicked off. 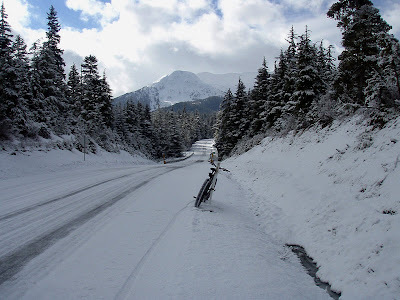 I don't remember much about the ride down because I was terrified, hearing only the squeal of my wet brakes and seeing only blasts of white, wet powder kick up from my wheels. Within minutes I was back at the road. 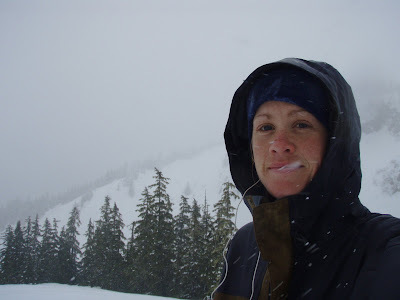 The snowpack was quickly disintegrating to slush; my 4-inch tires blasted me with so much water I could barely keep my eyes open. There was little I could do but clench my fingers and toes in wet gloves and wet shoes and embrace the full-body pain that is a 20-degree windchill (downhill at 40 mph in 35-degree air) through soaked clothes on soaked skin. I hate it when rides come to this and I should, really should know better by now. I know enough to know that once the chill starts, I only become colder and colder and colder. I also know enough to know that it's not the end of the world. Biking hard never seems to warm me up to optimal temperature (the faster I go, the harder the windchills cut through), but it does keep the hypothermia at its lowest level. The worst part about a too-cold, wet ride is coming inside once I'm done. I never have the time to warm myself slowly, so I have to go with the rip-the-bandaid-off route: A hot shower. It's the kind of pain that's hard to describe, but easily forgotten - memory is usually merciful when it comes to that level of trauma. If I could realistically remember the way those hot showers feel, I would probably never get on a bicycle again, at least when the temperature was below 60. Descriptions that run through my mind during those intense moments generally follow the lines of "A Million White Hot Needles of Death." That is, when I'm not trying to rip my hair out as a way to feel less pain. So I took a bad shower and vowed, again, to always, always overdress when I'm cycling in wet conditions. Two more inches of snow fell while I was at work. The sun broke out again as I was returning from my dinner break. Filtered yellow light sparkled on the snow, which coated every tree, every limb, every tiny branch. Snow gave the land a color and depth that I had forgotten in the featureless wash of early spring. It looked so soft and billowy that I wanted to dive right in, and roll around. It hurt to go inside again, but not in the same way. I yelped as wet snow soaked through my socks, filling the empty space where I stood in a snowdrift, thigh deep and sinking. It was a struggle to even lift my leg in this slush, so close to liquidation that it had become a solid, like wet cornstarch or quicksand. A deceptive solid. Not solid enough to hold me, just solid enough to trap my foot - soon to be, I feared, trench foot. I swung around to search for the trail. I had abandoned my bike a mile back to press on as a hike. Now I was swimming. It was time to swim home. Time to give up on this whole snow hiking/biking thing. Time to leave the mountains alone until their permanent surface re-emerged from this rotting seasonal veneer. Time to think about "summerizing" the Pugsley to prepare him for the season of salt water and sand. Time to give up on winter. So we wait now, for something. Summer, I guess. I know summer only in vague terms. It begins the day the Mount Juneau trail finally clears; the day the first black bear makes a raid on the Rainbow Foods dumpster; the day I can finally wear bike shorts. Geoff, on the other hand, knows exactly when summer begins. He has the date marked on the calendar. April 22, 6 p.m. The day the last spring ferry heads south out of Juneau. Then I will be alone all summer long, and it's starting to sink in. I remember the last time I lived alone in Juneau, watching 2 a.m. Cartoon Network in a damp hotel room and eating my best meals at the Safeway deli. I like to think I can keep my own bad habits in check. But then I think about the Subway guy who saw me so many times he had my *exact* sandwich memorized and even asked me out, and remember there are fates worse than loneliness. Geoff asks me every day why I don't just leave with him. "Because I have plans," I say. "Because I have cats," I say. "Because I have health insurance," I say. "Because I have a job," I say. "Always with the jobs," he says. "I need to feel like I have a grasp on the future," I say. "And that too," he says. When I'm at work is when I feel most content about my decision to stay. It's earlier, when Geoff is elsewhere and my time is only mine, that I wonder why it's so right to aspire to life in front of a computer screen and so wrong to aspire to life on a bike ... even with cats to support. But then I ride my bike and feel happy. And I go to work and feel content. And the snow will climb higher up the mountains. It will finally disappear. And then it will return. Not every moment inbetween has to be an adventure. There will be time for that later. Always later. Just about every time I go out riding these days, I imagine what life will be like for Geoff during the Great Divide Race. Sometimes I feel jealous. But most of the time, I just feel a pained, pre-emptive sort of empathy. I think a lot of casual fans imagine the challenge of the Great Divide Race is its length. And it is long - 2,500 miles long. But I think the most important route statistic, the one that is overlooked all too often, is the sheer amount of climbing - more than 200,000 feet along the way. And if you have a goal to ride this route in say, 24 days, you are going to be spending a lot of time in your granny gear slumped over your handlebars. 100 miles per day on a mountain bike? That sounds tough. 10,000 feet of climbing per day? That sounds like something that already has been outlawed in most developed nations. So I think about the sheer audacity of the Great Divide Race and smirk when I set out on a training day like Friday - hill intervals. My goal was not to ride intervals up the hill but to ride the entire hill as an interval, then bomb down it, then up again. Since the "hill" is five miles long and gains about 1,200 feet, I didn't expect to just sprint the whole way up it. But my first run felt strong; I kept a good average up the steep stretches and didn't let up on the more gradual portions. I was a spin master, conqueror of hills. I swallowed a lot of goo and gravel running 40 mph downhill without a front fender over my fat mountain bike tires, but I made the U-turn feeling awesome and thinking "this hill thing isn't so hard after all." Then, about halfway up the second climb, I started to unravel. I began to feel ill from all the acid gushing through my legs. I started hallucinating big sparkly snowflakes near the top, though I'm not sure it was even raining. I made the run back down and returned for a third and final climb, locked into the small ring before the end of the first mile, my quads transformed into tenderized meat mash by the top. I felt cooked, toasted ... which is good. It's what I was going for. But when I looked at my GPS for the day's totals, it told me I had climbed 4,183 feet. And all I could think about was multiplying that by 50. Today Geoff logged his weekly "tempo run" by racing a 10K out in the Valley. He briefly urged me to sign up for the race and I briefly considered it. After all, I'm in ideal shape to go out and ride eight-hour days whenever I want - why not go out and pound out some easy nine-minute miles? But then I thought more about pounding my legs on pavement for six miles, and the fact that I haven't done any running, at all, since like ... well, let's just say I don't run much. I did a 45-minute 8K about two years ago and it completely wrecked me. All that impact left me sore and limping for two days. Not to mention what running does to my knees. It made me think about something I read in an article about the CrossFit trend. It made the point that in the modern world, people become so specialized in their fitness that nearly everyone, even the most "in shape" among us, is in actuality "unfit." All of the evolutionary skills our bodies are set up to master become lost as we cultivate useless pastimes and untested muscles. I need little machines to work my body? I can't run a 10K to save my life? If these were cavemen times, I would be the first to be eaten by a saber-toothed bear. Or so the CrossFit cult tells me. Anyway, I did ride my bicycle out to the race to act as a roving spectator, and I had a lot of fun. I pedaled along the course and took pictures of Geoff and shouted encouragement to other racers and friends. I pedaled back to the finish line and watched Geoff finish in second place. As he cooled down, I returned for one final run to the turnaround. I passed the last runner, who was being shadowed by a couple of race sweeps on bicycles. I shot her my biggest grin and a thumbs up. "You're doing awesome," I said. She just lowered her eyes and shook her head. I got the feeling that she was burrowed deep in her pain cave, and didn't want some random chick on a bicycle shining any artificial light through her tunnel. I started to worry that I hadn't sounded genuine in my encouragement. It's tough to be in last place, especially when you have race sweeps hanging right off your rear. I wished there was a way I could turn around and tell her how much I admired her. I wanted to say "Look at you! You're running 10 kilometers and you're succeeding, which is a lot more than I lined up for this morning." But of course I didn't do that. I left her alone on my final pass. But I cheered really loud when she reached the finish line. It inspired me to think about taking up running. But first I need to master my distance climbing. I wasted a fair amount of time this morning moping around the house, gazing at my Karate Monkey and randomly making little adjustments on the bike. I felt like a kid who just received a brand new snowboard for her birthday ... in July. A coveted new toy and nowhere to ride it. Every spring, every community in Alaska must endure the awkward transition known as "Breakup." Breakup is like the period between Christmastime Academy Award contenders and summer blockbusters when every movie you see feels like a barely-constitutional alternative to waterboarding. Or like the horrible year in junior high when even the cutest kids get braces and pimples and walk around looking like they've been slapped with a fugly stick. Basically, Breakup is when all the ice begins to melt and everything gets really sloppy. 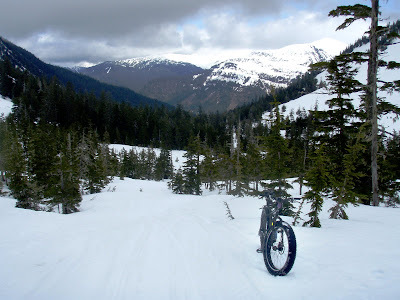 Winter activities become unappealing because the snowpack turns to messy slush, and summer activities are still impossible because everything is covered in messy slush. Nobody in Alaska really likes spring much. I don't really mind it, most of the time. I appreciate the longer daylight, and 41 and raining beats 31 and snaining any day ... and I think, if we Southeast Alaskans are really honest with ourselves, it's basically Breakup here year-round. But even I have days when I feel the walls closing in; this is the time of year I impulse-buy stuff. This is the time of year I mope. I dragged myself out the door, finally, with a resolve to go for a hike. I stupidly picked the East Glacier Trail loop, which has a ton of stairs, reasoning that I could take the stairs up and the switchbacks down. But with all the newly-thawed waterfalls gushing over the trail, there was more steep, wet ice than I could deal with. I took a hard fall right on my back before I decided the trail was too treacherous to climb any higher. Then I had to inch my way down endless flights of ice-slicked stairs. I tried to salvage the afternoon by going for a bike ride. But I had spent so much time cleaning my new bike after yesterday's ride ... I couldn't bear taking her out in the slop again. So I grabbed my creaky old Roadie, which I don't really bother to clean anymore, and rode grumpily along the glass-strewn gravel still coating the North Douglas Highway. I hit the headwind on the way home and tried to crank out some intervals, but my heart wasn't in it. I need something to train for. Thursday nights are basically my "Saturday night," but Geoff is now only weeks away from his trip south, and is pinching pennies with surprising zeal. So we can't really go out any more unless I'm buying. He made this lasagna by mixing a can of tomato soup and tomato paste, then pouring it over flat noodles with a thin layer of peppers and a little Parmesan cheese. It was tasty ... but a little hobo dinner-esque (and totally my fault ... I was supposed to go shopping.) We watched this horrible quasi-musical movie on DVD (amazing the dregs of filmmaking that can be dredged up on Netflix.) The whole thing was funny, actually ... just an off day. How many more months until winter? My Karate Monkey is done! Strange how these things come to pass. It wasn't even a month ago that I was happy as could be with my Gary Fisher. How does a person shift from "I need a new bottom bracket," to, "eh, what the heck, I'll just buy a whole brand new bike"? Very quickly, very easily, I'm afraid. Combined with all my winter-riding expenses, my bank account is now hemorrhaging money at an alarming rate. But since when do I care about money? Give me shiny goodness! A close-up shot of the Reba fork. It has a pop-lock, which I like since I do so much pavement riding just to access trails. And when it's not locked out, it's oh-so-buttery smooth. You can't even tell you're bouncing up and down. And here's the drivetrain. Nothing to really brag about, but it is notable in that it's brand new. When I built up Pugsley last fall, nearly everything I stuck on it besides the frame came secondhand. With the Monkey, just about everything is factory new. Those platform pedals are a multiple-crash-deformed relic from the Snaux Bike days. The Ergon grips were Sugar's. The seat, seatpost and fenders belong to Geoff. (I still have to acquire my own.) But, beyond that, this is the newest bike I've owned since my touring bike circa 2004. I guess my chosen build of the Karate Monkey is a little strange. I took a perfectly good, rigid, single-speed-ready steel frame and slapped a bunch of bling on it. I'm not ashamed. People with knees like mine aren't lining up to own single speeds, and I'm not against suspension. I just didn't think I required full suspension anymore. I don't think I'll even miss the bouncy on back. I like Kim. I think she and I stand to become good friends. Even now, when I'm with Kim, I can close my eyes and imagine a world where there's no job to keep, no cats to feed, no rent to pay; a world where the trails don't fade out and the road doesn't end; a world where I can lift my head up, and just ride. My Gary Fisher Sugar sold on Sunday. I went to my local bike shop to pick up a shipping box, realized they were closed on Mondays, and drove around back to dig one out of the rubbish pile. (I was disappointed to discover that there was no Orbea in that box. Just tattered packaging materials.) Tomorrow I will box Sugar up ship him off to his new home in the frozen land of Minnesota (where I'm sure he will feel right at home.) Tonight is our last night together. I wanted to take him out for one last ride, but I didn't want to tarnish the scouring I gave his drivetrain or risk damaging a part of a bike that no longer belongs to me. I felt a tinge of regret when I realized I couldn't remember our last ride together. Since I discovered he needed a new bottom bracket, he's sat idle - and sometimes in pieces - in my front room. There was never a grand send-off, never a tearful goodbye. I like to joke about being in love with my bikes, but when I'm honest with myself, does it really matter? Can I really be so emotionally attached to aluminum and steel? Well, yeah. Yeah I can. When I think about Sugar, I think about years (three years!) and miles (thousands!) during which that aluminum and steel carved its way into who I am and how I see the world. When I think about Sugar, I think about myself as a fearful novice coasting the gravel rollers of the Idaho Falls hillsides. I think about gaining more confidence on the steep singletrack of Millcreek Canyon in Utah. 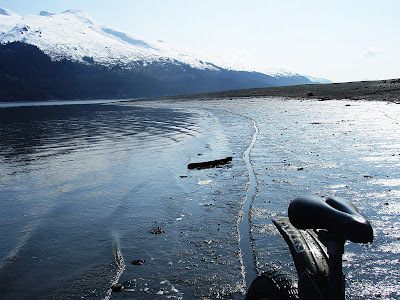 I think about honing my exploratory skills on the elaborate web of trails beyond my new home in Homer, Alaska. I think about discovering my endurance on the soft slush beyond the Susitna River. I think about perfecting my technical moves as I repeatedly circled the same loop during the 24 Hours of Kincaid. I think about realizing the power of unconditional joy as I kneeled into the dirt, nearly cashed out, at the top of Resurrection Pass. When I think about Sugar, I think about growth. I think about change. I think about loss. But the truth is, this is good for me. It's good to make a clean break. The fact is, Sugar is still a good bike and deserves to be ridden, deserves to be thrashed, deserves to be ground into the dust he was destined to become. No bike deserves to rot amid the cobwebs and asbestos in an apartment basement. Every mountain bike deserves a dignified death by steady abuse, if not a brilliant flash-out in a blaze of glory. If I'm not the one to levy that abuse, if I've moved on, then I have to let him go.